I remember my mother telling me, when I was ten, never to talk about myself—that people would find it boring. Instead, she said, I should ask people questions because everyone loves to talk about themselves. Which was kind of circular, in my opinion. If we all took her advice of not talking about ourselves, Facebook would collapse, and the rest of social media would come to a grinding halt. And I wouldn’t have to update my website yet again. Let me start with something which, in comparison to everything else that’s been happening, appears minor and undeserving of attention. Yesterday at the supermarket, the woman behind me in the queue turned out to be an ex-student, Utte, from Flinders University. I remembered immediately that she’d been a lovely student in particularly wonderful class in 1996, the year that I retired. (I was 50.) She said she’d heard me speak last March at Adelaide Writers’ Week but hadn’t been bold enough to talk to me afterwards because I was now so famous. Good grief. How sad! It had taken courage, even in the supermarket line, she said, to make herself known. How many other students whom I used to love and adore pass me by because they’re now too shy to say hi? Heart-breaking. Utte finally broke the ice, and in front of the check-out woman, raved about what a brilliant teacher I had been, in her opinion, and how I had changed her life, and so on, and on, and on, and on. 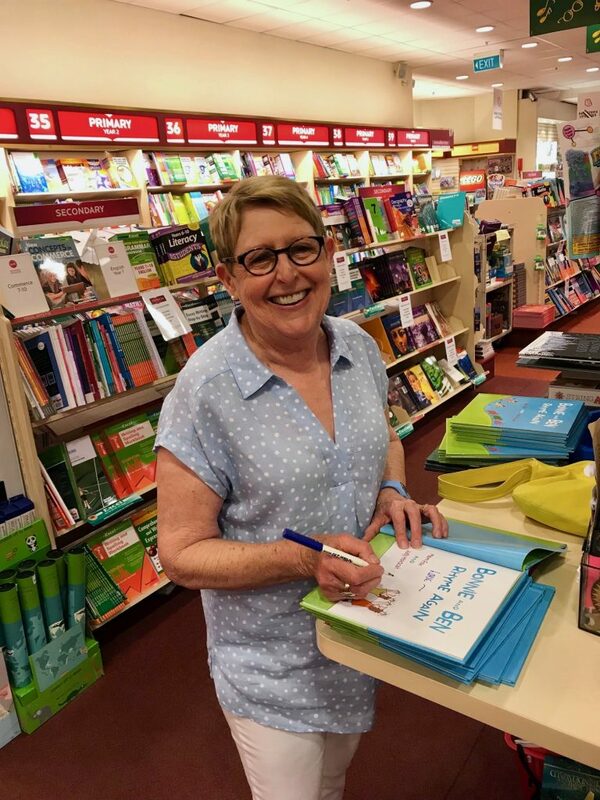 The supermarket check-out woman, who had known me only as a children’s writer, said, ‘Omigod, I’ve got tears in my eyes.’ And she had! I was choked up myself. I loved teaching with a mad passion and stopped only when the writing/business side of my life began to encroach on my preparation time. If I couldn’t teach well, I decided, I wouldn’t teach at all. When memories of that time are awoken out of the blue by people like Utte, they bring a lump to my throat. I do hope people remember I was a teacher once. And I hope more ex-students say hello. I saw another, Sarah, later in the day at my grandson’s school—thankfully we squealed with recognition and hugged each other. Anyway, apologies to my poor mother, and to you, but there’s a lot more news…How’s this for a start? 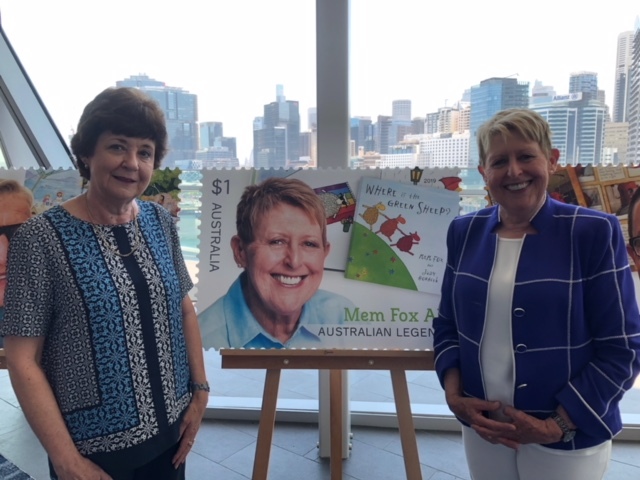 I’ve become an Australian Legend, with a stamp of my own. Yes indeed. 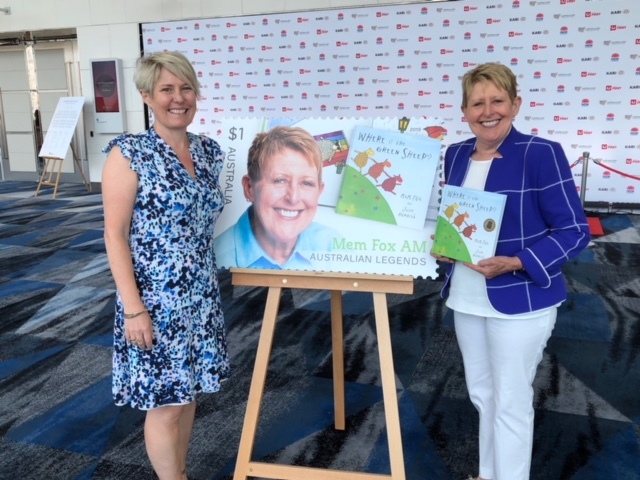 This photo was taken at the Australian Day celebratory lunch in Melbourne on January 17th.Four other Australian children’s authors were also made Legends by Australia Post: Morris Gleitzman, Leigh Hobbs, Alison Lester and Shaun Tan. 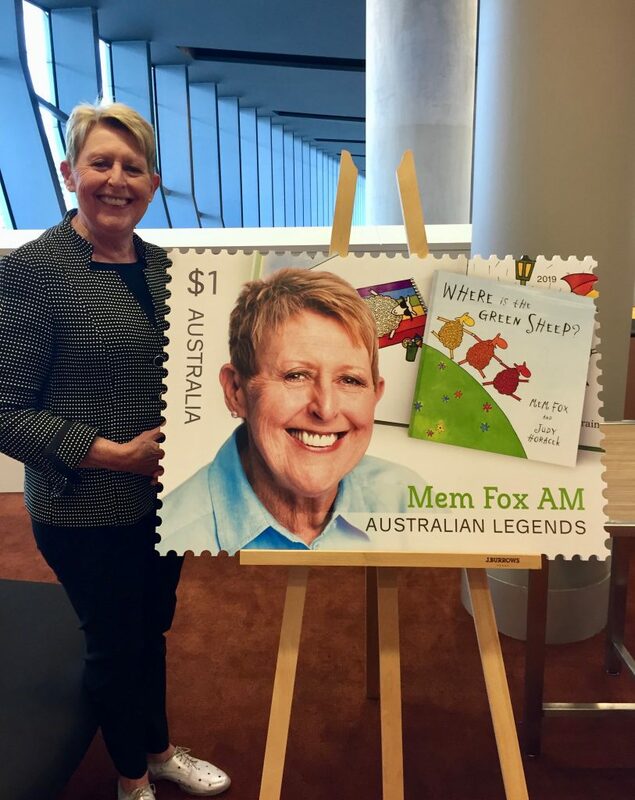 The stamp, as you see, has my face on it, as well as the cover of Where is the Green Sheep? Possum Magic had had the honour of the $2 coins and collectibles in 2017, so it seemed fair bring Green Sheep to the fore this time. The troubling thing about all of this is that other well-known, adored Australian authors, who are household names, were not chosen. Five is such a small number. Even so… And before I go on, many thanks to Australia Post and Penguin Random House (Hello, Kristin! Hello, Dot!) for their goodness and kindness. 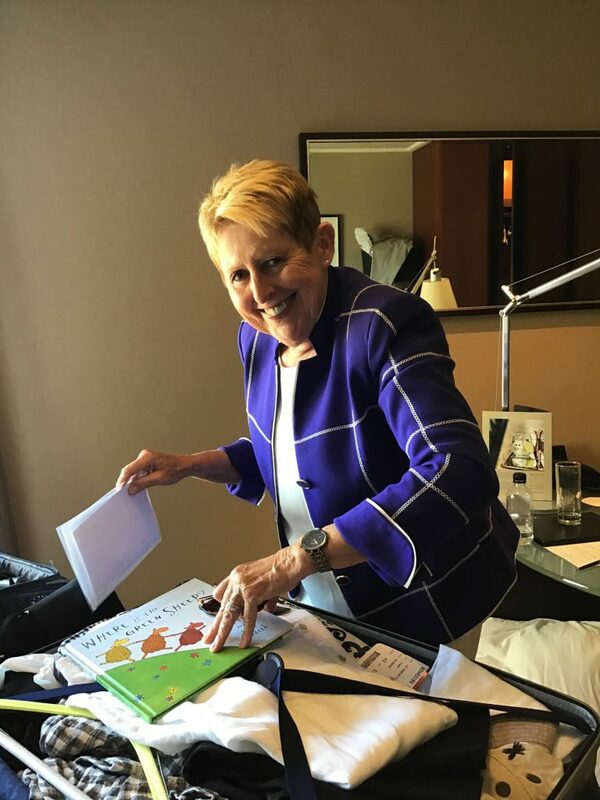 There were glittering Australia Day lunches in Melbourne on Jan.17th and Sydney on Jan.18th (this was prior to the actual Australia Day on Jan.26th), during which we authors were made prominent and lauded. Yet as an Australian, I know the one thing I must never do is to laud myself. We don’t like it in others, so we don’t do it ourselves. It’s a national characteristic. It keeps us all on common ground. Other nations may be wild in their applause of success, but we are suspicious of it. The problem is that on a website up-date like this it’s a bit of a balancing act to be able to tell the news without also appearing to be a self-aggrandising ning-nong. Forgive me if I’ve over-stepped the mark. This is me with, guess who? An ex-student! I know, hilarious: three ex-students in one post. 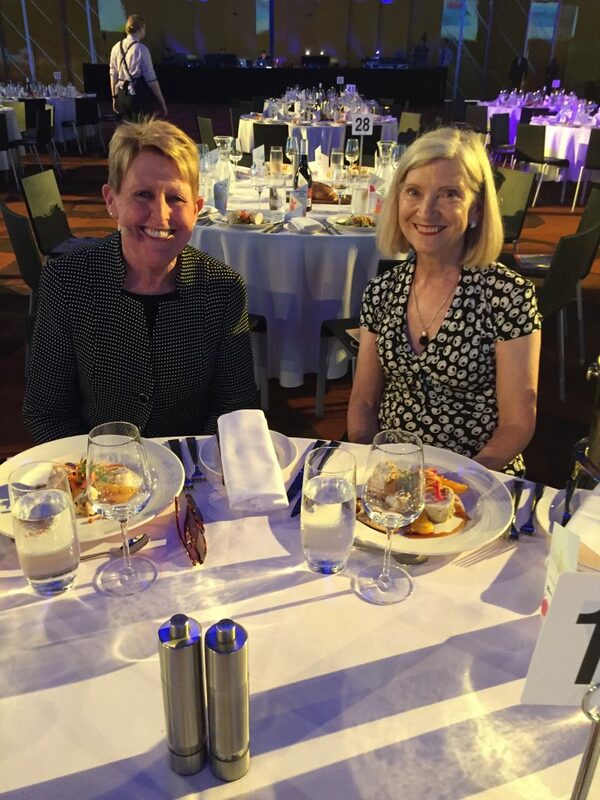 This is Gail Kelly, with me at the Melbourne lunch/launch on January 17th. She’s the glamorous one. The growth on the side of my face is actually a Maddona mic, which was mandatory on the day. Penguin published Where is the Green Sheep?, so Dot Tonkin, the marketing and publicity director from Penguin Random House Young Readers was grinning as widely as I was. I wish I could post photos of our Sydney/Byron Bay holiday on this site but it’s a family decision to keep private days as private as possible in this mad age of showing everything and telling even more. Suffice to say that like millions of other Australians whose summer holidays are over, a Great Time Was Had by All. 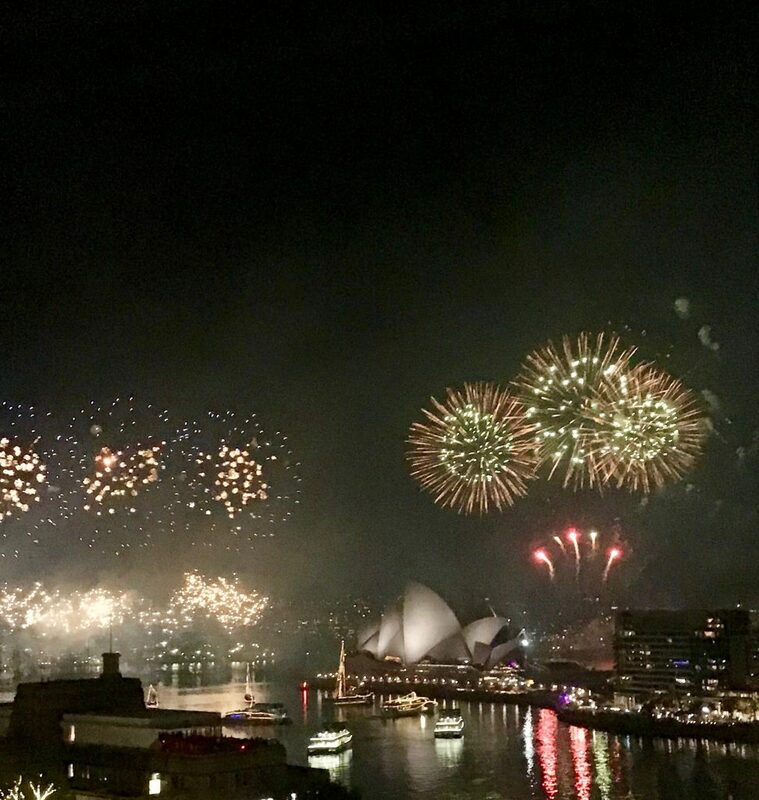 We were in Sydney for the New Year fireworks, and all of us, even I ran out of descriptive words: Superb! Magnificent! Incredible! AAAH! Unbelievable! WOW! Good GRIEF! Spectacular! OMIGOD! Fantastic! The same adjectives could have been applied two days later when my husband and I celebrated our 50th wedding anniversary on January 2nd: Oh, oh, oh! Superb! Magnificent! Incredible! Unbelievable! WOW! Good GRIEF! Spectacular! OMIGOD! Fantastic! OK, so it was only an extra-special lunch at an extra-special restaurant over-looking Sydney Harbour, but it was more than extra-special to us. We met at drama school in October 1965, so it feels as if we’ve known each other and been best friends since we were children. 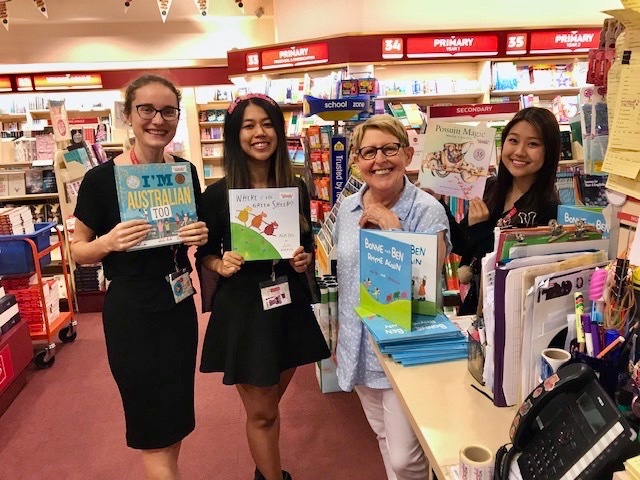 While were in Sydney we went several times to the Dymocks bookshop in George Street. I was reading so fast and so much I was terrified of running out of material. I told one of the fantastic assistants that I’d read ‘everything’ and needed a certain kind of novel, and asked what could she recommend. ‘So you’ve read everything?’ she said wryly. ‘Have you read any Rachel Cusk?’ I had to admit I hadn’t. Now I’m hooked! More of that later…. Dymocks had a huge, specific display of my books, overwhelming really, and they didn’t even know I was around. So kind. Eventually I revealed who I was, thanked them, signed lots of stock, sort of anonymously, and had photos taken with the delightful staff. Last year I ‘read’ 49 novels. Four or five of them were not read beyond a few pages: why they had been published in the first place was a consuming mystery. But Rachel Cusk was a great find and an excellent start to my reading year. I adored Outline and am dying to read the next two in her trilogy: Transit, and Kudos. I was side-tracked by a long and very enjoyable novel, William Boyd’s latest: Love is Blind; and now I’m now mountaineering through Milkman by Anna Burns, last year’s Booker Prize winner. It is by turns enraging in the demands it makes of the reader: no paragraphs visible for miles, for example, which is daunting late at night, and no one is ever named (because names reveal a character’s religion?) but it’s also riveting in its ghastly, sinister details of the Troubles in Northern Ireland in the 1970s, and makes one wonder what effect Brexit will have on the same town if everything falls apart again. In spite of its infuriating aspects, strangely, I highly recommend it. No, this isn’t the picture of a bushfire. It’s a sunset photo, taken from our balcony. 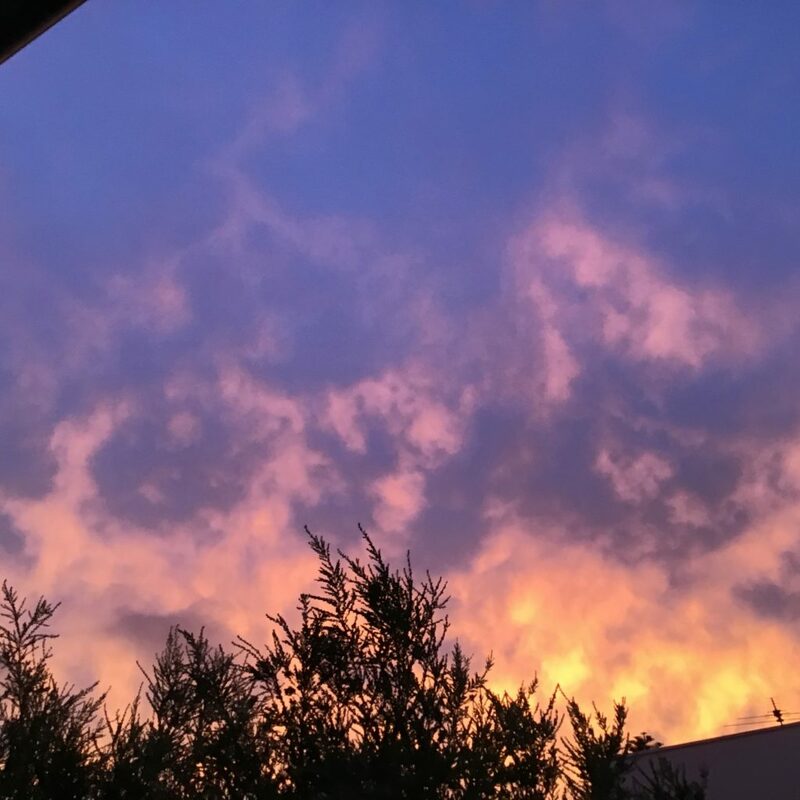 But on January 24th we, the population of Adelaide, lived through the hottest day ever recorded in our city: 46.6ºC or 116ºF. I thought we would all die, but amazingly we are still alive and typing. ‘Shocking’ doesn’t describe it. My nine year old grandson and I spent two hours in the sea in the morning, which set us up for remaining still for the rest of the day. As far as I could ascertain no one moved. My husband went to the supermarket and said the roads were empty. The heat brought a halt to everything, although our French-teacher daughter was unfortunately back at school for stifling start-of-year meetings. Even my eyedrops were warm. A young rainbow lorikeet in the grapevine outside our kitchen window was panting so much it didn’t stir as I approached it. I thought it was literally going to drop off its perch. I put the hose on ‘mist’ and misted it for five minutes, after which it revived and flew away, without so much as a thank you or a backward glance. Let me end where I began: as you know, my mother told me early on never to talk about myself, because people would find it boring. Instead, she said, I should ask people questions. So I did. I’d been talking about myself to a charming woman at the Australia Day/Australia Post lunch in Sydney when I began to feel Mum on my shoulder, whispering that I should be asking questions, not yabbering on. 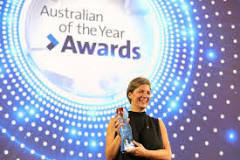 So I said to this person, ‘Tell me your story.’ She replied, ‘I’m the Australian of the Year.’ Instead of allowing the floor to swallow me up, which was my preferred option at the time, I said: ‘Im so sorry, I didn’t recognise you, but I’m ecstatic to meet you. I was over the moon when you were selected last year because you weren’t a sportsperson, or a media celebrity, you were a woman with a BRAIN!’ We laughed like drains (what a cliché: I must do better…) and had a big hug. Her name is Professor Michelle Simmons. She’s a professor of quantum physics and here’s her photo from Australia Day in 2018. I’m proud to live in a country where the faces of children’s authors are put on stamps, and female professors of quantum physics can win the greatest civic award of the year. This year’s Australians of the Year are the wonderful Dr Richard Harris and Dr Craig Challen, who were instrumental (an understatement) in rescuing the 14 boys trapped during the horrifying Thai cave disaster last year. Well, in the end, they prevented the disaster. All hats off to that brave and brilliant pair!